2 Dashboards so that you have a clear overview of your long term business and vacation rental business in the same place, yet seperate. Indeed, in reality there are 3 dashboards, the first one you see welcomes you upon login to the software and is more of a "Welcome, where do you want to go?" page. 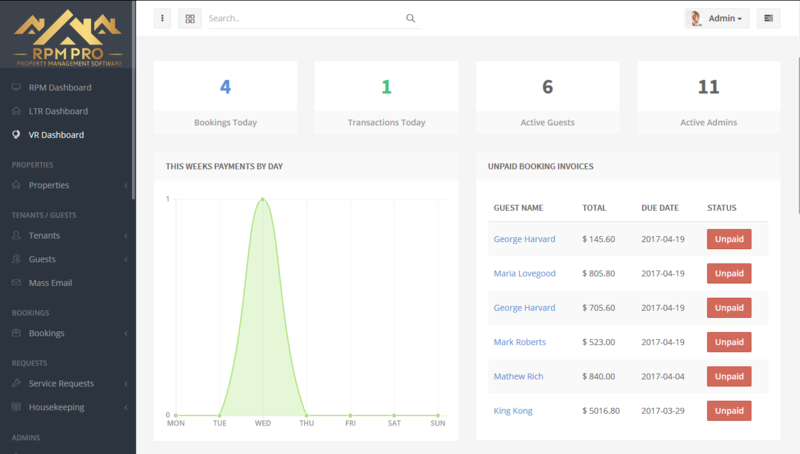 This initial "dashboard / welcome page" does however give you a quick overview of how many properties you have for each vacation rental and long term rental alike and also how many tenants, guests and landlords you have. Underneath these totals you have a few buttons that will take you to the most important functions and pages within the software. So whats on the RPM Pro dashboards? Well the dual dashboards are designed specifically to give realtors and agents a quick yet detailed overview of each side of their business. It shows a things like booking updates and latest quests on the vacation rental side but then things like properties with no lease, rent payments due and leases expriring on the long term rental side in a quick and clear way. Scroll down to see more specific features for each of the dashboards. 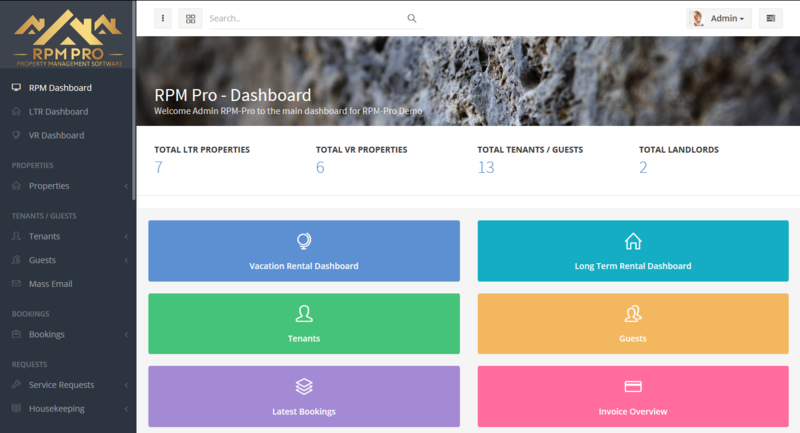 Inside the vacation rentals dashboard you will see a full and easy overview of everything that is happening for the vacation rentals side of your business. This includes overview of paid invoices, latest bookings, properties, service and housekeeping requests and of course your guests. Using this dashboard you can quickly link to anything you want to look at in more depth. This functionality allows easy navigation alongside the extensive menu thats always on your left. 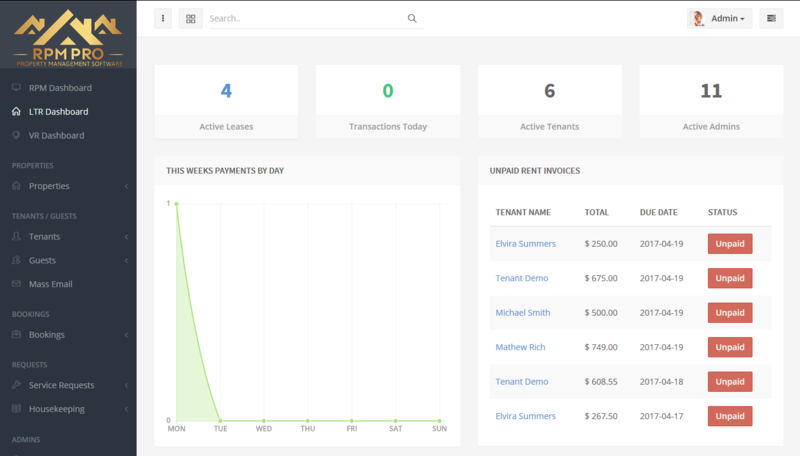 On the long term rental dashboard inside RPM Pro you will find a quick and clear overview of your properties, leases, tenants, service requests, rent payments and expriring leases. This allows you to see quickly what needs your attention most, like following up with unpaid rent or arranging a meeting between a landlord and tenant to sign a new lease for example. RPM Pro is waiting for you! Including the above AND MANY MORE amazing features starting at just $50 monthly.